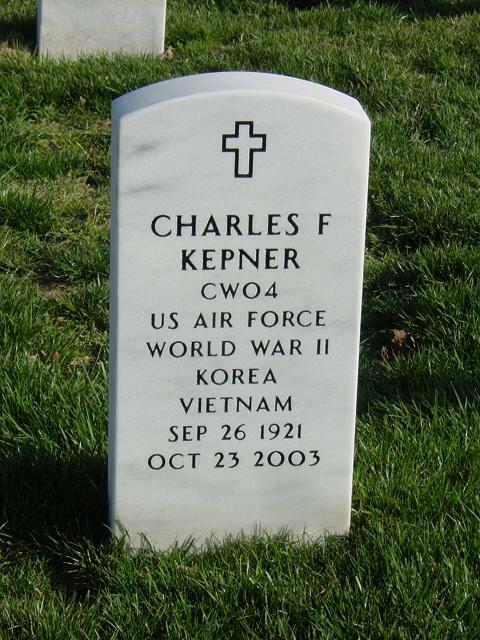 Charles Fred Kepner, 82, an Air Force Band member who retired in 1966 after 20 years of military service, died October 23, 2003, at a nursing home in Leonardtown, Maryland. He had Alzheimer's disease. Mr. Kepner was chief arranger, pianist, composer and bandleader with the Air Force Band and was the organizer and first leader of the Airmen of Note, the official Air Force dance orchestra and the successor organization to the Glenn Miller Army Air Force Band. On location, he oversaw the Airmen of Note as the group performed in many of the scenes for the Universal-International motion picture "The Glenn Miller Story." After retiring from the Air Force as a chief warrant officer, Mr. Kepner taught piano and music composition from his Oxon Hill home and was a pianist with civilian and military organizations in the Washington area. He moved to Leonardtown last year. He was born in Waynesboro, Pennsylvania, and studied music at Catawba College in Salisbury, North Carolina, the Juilliard School of Music and the Manhattan School of Music. Later, he was a pianist with Penn Acres in Pen Mar, Pennsylvania. In 1945, he began his military career with the Army Air Forces as a radio operator. He joined the Air Force Band at Bolling Air Force Base in Washington in 1947. During his Air Force Band service, Mr. Kepner was guest conductor, clinician and adjudicator at music clinics and conferences throughout the East and Midwest. He was a composer and wrote for high school and college bands, and big band-era organizations, including those led by Tommy Dorsey, Jimmy Lunceford, and Buddy Morrow. "Cuban Fantasy," published in 1954, was the first of several published works by Mr. Kepner. His composition "Forward for Peace" was premiered by the Air Force Band in President Dwight D. Eisenhower's inaugural parade in 1957. As a young man, Mr. Kepner was an enthusiastic tennis player. Later, he was an avid golfer. His avocations included model railroading. Survivors include his wife of 63 years, Doris B. Kepner of Leonardtown; a son, Thomas F. Kepner of Park Hall; a sister; four grandchildren; and two great-granddaughters. On Thursday, October 23, 2003, CHARLES FRED KEPNER, 82, of Leonardtown, Maryland. Loving husband of Doris Birely Kepner; father of Thomas F. Kepner; brother of Frances Lower; four grandchildren, two great-grandchildren. A graveside service will be held on Monday, November 3, 2003, 2 p.m., at Arlington National Cemetery. Memorial contributions may be made to St. Mary's Nursing Center, PO Box 518, Leonardtown, Maryland 20650.